I have chosen this title for my paper because details which may enable us to picture old Hatfield more fully to our imagination than we otherwise could do are to be found in documents of that date which still exist. But distant though that time is, Hatfield was then already old. Many a building which we revere for its antiquity had not then come into existence,but there were buildings standing then which were as old to the inhabitants of the fifteen century Hatfield as theirs are to us. The House was not there, nor even the old Palace, though it soon was to be. The Church Tower was to come with the Palace, probably from the same hand; the Salisbury Chapel with the House a hundred years later. But the main parts of the present church-the chancel, which we now call the Brocket Chapel, the nave as far west as the font, the transepts [though different and broken up into chantreys and side chapels]-had lately been finished or were actually building 500 years ago;-gradually replacing the earlier buildings whose site they occupied and some of whose very walls they probably incorporated. No doubt as they watched this slow transformation of their familiar place of worship, the old people grieved for what was taken away, and the young ones rejoiced in the new beauty that was growing before their eyes-just as they would do now. Of that earlier building the most certain survivals are the little chapel in the southern aisle, where the organ now stands, and the transept wall facing it. But the process must have been almost continuous. Altered and enlarged, bit after bit added on, taken down and rebuilt, the Church has gone on we may believe, from a period very little subsequent to the introduction of Christianity into England. The very site chosen for it is in its prominence suggestive of the time when it was reared as a witness to and signal of the new faith, to draw together for worship the scattered half-barbarous dwellers in the wild, little-cultivated country around. Sweep away in your imagination the houses which now crowd round it, and you will see how steeply to the west and north and more gently southwards, the ground slopes away, and the Church stands out on a spur of the high forest land overlooking the earlier-cleared and cultivated valleys formed by the streamlets of Town-Bottom and Batterdell, and the gradually rising plain which stretches westward to St Albans. All this would have appeared more clearly to the Hatfield man of 500 years ago than it can to us now, though already then the village was creeping up around the Church. But the great house of the parish, which was then called the Manor House, was not as now to be found near the Church at all. 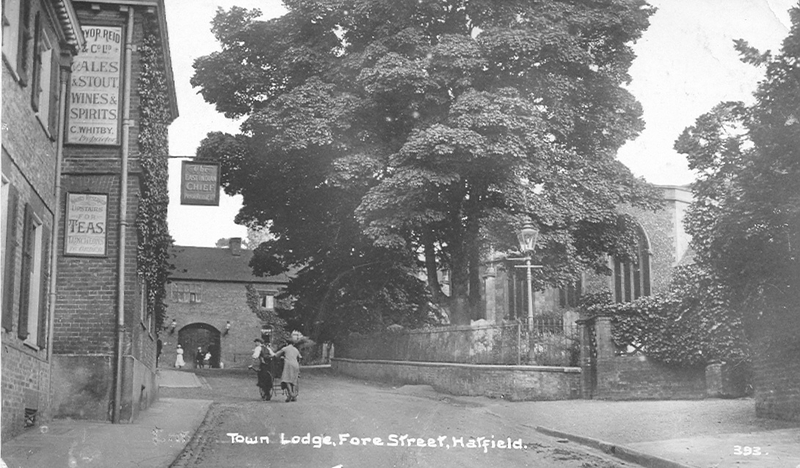 The lord of the manor was a great man in those days and had great powers over the dwellers in Hatfield parish, and the Manor House was the place from whence that authority was enforced and where also with the help of a jury of old parishioners all that we should now call the local government of the parish was carried on. It was the centre of the parish for all secular purposes, as the Church was for religious ones. Where did it stand? Before answering that question I would remind my readers that the original form of the name Hatfield was Heathfield-and that it must have been derived in those very early days when names were first given to places, from some space or spaces of open moor or heath-common as you would call it now-in the midst of a great forest which then covered most of Hertfordshire. Well, it was at the western end of that stretch of bare unproductive land, the southern portion of which we now call Billet Common, and which may well have been the original “heathfield” from which the manor and parish took their name, that the old Manor House of the 14th and 15th centuries stood-and had stood four or five hundred years before-near the site of the present house of Bush Hall. The Bishop of Ely was then lord of the manor of Hatfield-which is why it is to this day called Bishops-Hatfield in all legal documents and old maps, and why also the Church is dedicated to St Etheldreda, the patron saint of Ely. We have references to this old Manor House in these papers which enable us to form some idea of it. It does not seem to have had much accommodation-few rooms, though probably large ones. There was a great hall, two great chambers and some lesser ones; a smaller hall, a soldiers’ guard room-even Bishops went about with armed guards then-and a Chapel. It was roofed chiefly with oak shingles, a small flat-flat roofed portion of it with lead and its walls were made most probably of timber and daub-great cross-beams of oak filled in with sun dried clay and plaster. Round it were gathered the farm buildings for the work of the lords demesne land-some 800 acres, which he kept in his own hands and farmed;-the great grange roofed with tiles, the hay-barn and the granary, the stables for the oxen and cart horses, for my Lord Bishop’s palfrey and his men’s chargers, poultry house and the dairy-we find them all mentioned. And round them a high enclosure of wood or brick at either end of were great gateways with rooms built over them, and beyond this defence the tangle of river and brook and weir-stream, eked out no doubt with deep-dug moats and ditches. These defences were very necessary. 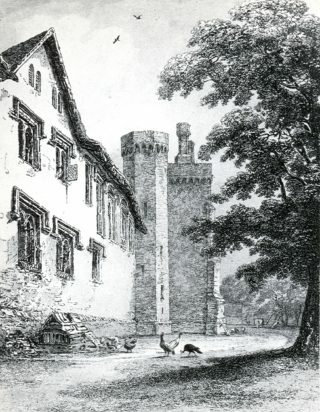 In the 13th century about 150 years before our date, a party of dissolute hunters with a great nobleman*, a relation of the King’s, at their head, had ridden over from Hertford, hunted the Bishop’s game through the Bishop’s own park, and finally in his absence and that of his guards, had broken into the Manor House. There they struck open, not only his casks of beer, but those of his rare foreign wines, and having drunk their fill had left the rest of the liquor to run to waste on the cellar floors while the steward stood helplessly by, entreating and protesting in vain. So we read in the old chronicle, and wonder whether after that event the palisade was not raised and the great gateways strengthened. Now, leaving the Manor House and its immediate surroundings, let us accompany the Lord Bishop on his way to Church. I doubt if he went there often except on high days and holidays, for he had, as we have seen, a chapel in his own house, and though he owned the manor of Hatfield the parish was not within his diocese. But he shall ride there now for our satisfaction, mounted on his palfrey, followed by his chaplains and servants and men-at-arms, along the same road which still curves round the northern end of the park. The same with a difference. For though it was an important road enough, connecting Hertford and its royal castle with St Albans and its great abbey, famous throughout England, it was neither metalled nor barrelled-I doubt if it was even gravelled. On the other hand it was drained on either side by ditches that would have put our modern road gutters to shame. We have a description of them in one old paper 5ft.wide they were and 5ft.deep, turfed and set with quickthorne. It was one of the principal tasks of the Manor Court of which I have spoken to see that these road ditches were kept clear and open. On the Bishop’s right as he rode, the fields sloped upwards as we know them, only unbroken then by high road or railway as they stretched on past the rector’s glebe towards St Albans. On his left, from within the wooden paling of Home Park, or “Little Park” as it was then called, thick trees overshadowed the road just as they do now. 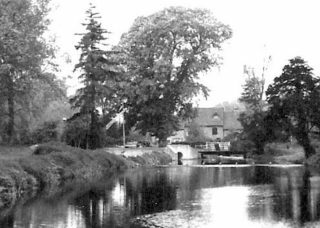 At their foot tinkled the clear little stream which rising in Combe and Conduit Woods had made its way along the twists and turns of Town-bottom, and now, where the black ditch at present runs, was winding round to join the river at Mill Green. Why was the Home Park then called Little Park? We must leave the answer to that question to next month. We were discussing at the close of last month’s paper why it was that what we now call the Home Park was always spoken of as the Little Park in old times. It was as a matter of fact a good deal larger then than it is now, stretching considerably further southwards up to and over the site of the present House and Palace. But it was called the Little Park because a much larger one existed. Beyond it, separated from it only by a narrow strip of cultivated land, was the “Great Park” which covered the whole of that distance now known as Woodside or St. Mark’s. It was surrounded by a wooden paling seven miles long and contained 1,000 acres, filled we read with a “great number of oak’s and beeches”, interspersed with open glade of grass where all the neighbouring tenants of the manor had right of pasture. In latter days it was called “Hatfield Great Wood”, and it was not finally cleared of trees and enclosed in fields till about two hundred years ago. There are many references to the Great Park in the old rent rolls and bailiff’s accounts, and some which strike one’s ear with strange familiarity. There is an item for repairing with timber and plates and spikes of iron “the gate of the Great Park called Newgate”, Robert Pomesbourne held twelve acres of land at “the Newgate” in the 13th century and another tenant held an acre in Newgate Street, the road leading past the gate no doubt. Then just about 500 years ago, there was a Mr. Thomas Pope who held 150 acres near the Great Park, his family died out soon after but they left their name behind them. So did one John de Camvyle [though he would not perhaps have approved of our spelling it Camfield]. His land was close to “Wild-barre”. The “barre” [or gate, as in Temple Bar] has vanished with the Park it opened on but we have got the hill which led up to it. Then there are five tylers or potters mentioned who paid rent to the Bishop for license to dig clay in the Great Park. The clay has long since been exhausted, the tylers and their trade have disappeared, but we all know the road or causeway by which they approached their clay pits. Woodside and Lower Woodside, Warren Wood and Woodhill, are all remains of the time when the Bishop’s retainers [yes and the Bishop himself] hunted the deer and the wild boar through the thick woods of oak and beech in the Great Park of Hatfield. 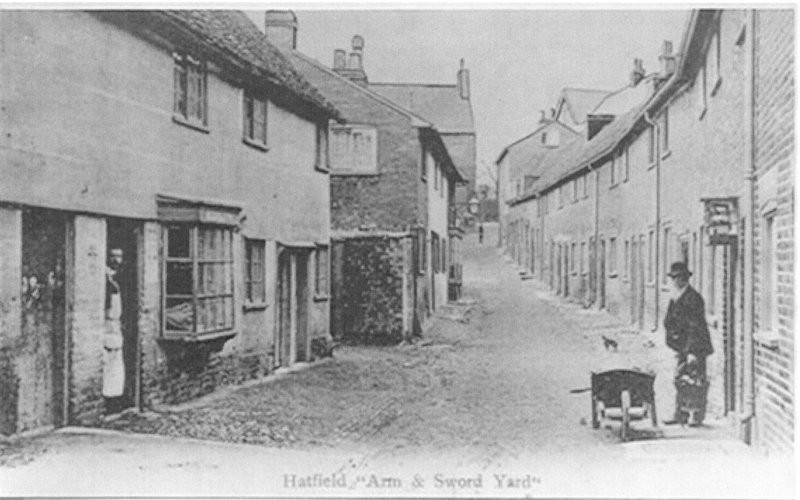 came the row of houses which formed the original hamlet of Hatfield. At least it is here we would place them, though the evidence is rather of the probable order. 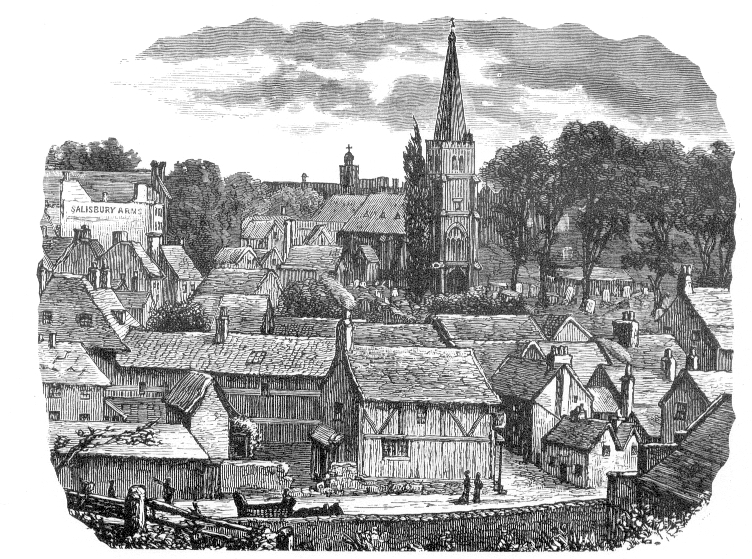 For these hamlets Mill Green and the Hyde, Roe Green and Stanborough, have probably the same origin, were inhabited by the hereditary tenants, the descendants of the old villeins or serfs of the manor, who paid no separate rent for their houses, which are therefore not mentioned in the documents at our disposal. As the position of these men rose to the freedom which they had already almost completely attained 500 years ago, their fortunes began to vary and no doubt their houses with them; little low wood built cottages with unglazed windows, and larger houses timber and plaster, tile roofed and with diamond paned lattices of twisted discoloured glass, would be clustered together in this group. 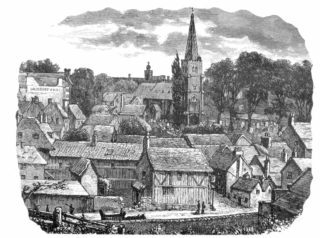 But as the Bishop passed them, and turning to his left round the alehouse at the corner mounted the hill towards the Church, he came upon a newer class of building and one which marked the progress of Hatfield from being a mere hamlet of rural cottages like others in the manor, to the position of its central village, and soon its town. These houses are not mentioned in the earliest rent roll extent that of the thirteenth centaury, but appear first at the time we write off. Eleven shops and one or two houses of apparently some importance are spoken of, let out on lease or by the year. Some are described as being on the north side of the Church, the beginnings of Fore Street, others either at the top of what is now Back Street or Georges Field, or perhaps to the eastward of the Church on what was to be the site of the Palace. But you must not imagine eleven plate glass windows like Mr. Sharp’s or Mr Cox’s, The building in which Mr. Walby’s shop and the one next to it stand is much more like those which must have met the Bishop’s eyes in the ride we are fancying. Only you must divide Mr. Walby’s shop into two, and there must be no glass or shutters in the windows. Two, three or four shops under one roof we read of, each with its long low opening, within which on an open counter the goods were displayed. What goods were they? Several trades are mentioned in the reports of the proceedings of the Manor Courts which guide us on this point. We can tell of some that were not there. There was no grocer, and there would have been little for him to sell. Tea, coffee and sugar were growing no doubt in far off spots on the world’s surface, but their produce was unknown in England, and in some cases indeed the places where they grew were undiscovered. 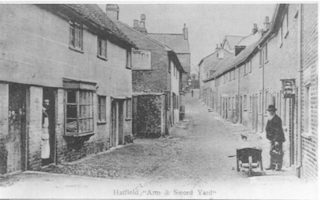 Candles were sold in Hatfield, a little later a women was fined 2d. For selling them of bad weight, but she seems to have been ale seller or inn keeper. Paraffin oil for lamps was still further from discovery than was tea and coffee; soap was I believe unknown and to a certainty unused by our ancestors at that time. Then I don’t think there was any draper at Hatfield 500 years ago. Linen cloth may have been occasionally had down from London; the finer kinds, both of that and cotton, with silken stuffs, jewellery, and the rarer spices used in rich men’s cooking, found their way in the country to the doors of those same rich men on peddler’s backs. All ordinary cotton goods, calico and the like were quite unknown; the King of England 500 years ago would have looked upon the cotton shirt of a modern working man as something unheard of and wonderful. 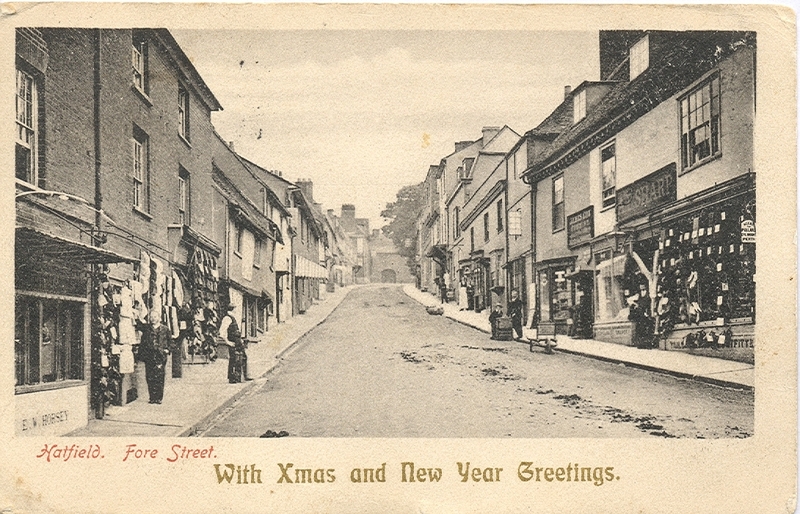 The men who stood aside on the road and doffed their caps to the Lord Bishop were clothed in under dresses of course woollen stuff, woven on hand looms at home or in some neighbouring town from the fleece of Hertfordshire sheep, and over then they wore leather jackets, and long leathern leggings covering their whole legs and feet. So the leather sellers whom we do find spoken of had the nearest approach perhaps to clothing shops. We read of one of them fined for making leggings of bad leather “to the great damage and deception of the King’s subjects”. One would rather like to see that verdict brought in against certain shoe makers of today. There were butchers, bakers, fishmongers, brewers, and last but not least, ale sellers “keepers of tippling houses” they are sometimes called. Twenty six of these ale sellers are recorded I regret to say as existing at one time in Hatfield, which considering the smallness of the population, showed considerable consumption of beer. Perhaps that was one reason why the records of the Manor Courts show also such a number of bloodthirsty assaults. One word as to the prices at which things were to be had in these shops. The figures in money would not tell you much, for money has entirely changed its value since those days. But measuring the values in relation to the wages which working men then received, we find that wheat and therefore bread was nearly twice as dear as it is now, but that cattle and sheep were sold at less than half their present value, making meat, leather and wool to that degree cheaper. Horses too were wonderfully cheap; the highest price mentioned in these papers corresponds to £5 of our money. All the result no doubt of the great expanses of waste land still existing where pasture was free or nearly so. As the Bishop mounts the hill, I would like you just to glance in fancy across the hillside to the right there is no Back Street yet and I doubt many houses in Fore Street upon that side to stop your view and see the great chalk pit, or “marlere”, as it was then called, cut out of the hillside. The Rector of the parish rented it at that time from the Lord. It has been disused for centuries, and its flat bottom within memory of our own times became a marshy receptacle for overflow waters of Batterdell. But it is familiar to us all now as Salisbury Square. We have brought the imaginary ride of our Bishop to a close and with it must end this paper. I hope you have found interest in this attempt to bring before our eyes a bit of old, old Hatfield before the new Palace and new House mingled its history with that of England, but where nevertheless Hatfield men and women lived lives just as interesting to them as ours are to us, and perhaps not so very different after all. I came across this artical some 10 years ago while researching the Mill at Mill Green where I worked as miller. Great Braitch Lane used to connect Coopers Green Lane and Green Lanes when I was young. At the Coopers Green Lane end there were Whitegate Cottages and at the other a factory (I think it was nicknamed the Box Factory) where two friends’ fathers worked. At some stage when the factory site was redeveloped for housing the lane was closed off. It is now overgrown! What a informative article? she must have done a fair bit of research to write it. Great Braitch Lane? I worked for the Hatfield Rural District Council 1952 to 1959 in the Engineer and Surveyors Dept but do not recall that road. What roads does it connect to?